How to master the art of persuasion—from the bestselling author of Talk Like TED. Ideas don’t sell themselves. As the forces of globalization, automation, and artificial intelligence combine to disrupt every field, having a good idea isn’t good enough. Mastering the ancient art of persuasion is the key to standing out, getting ahead, and achieving greatness in the modern world. 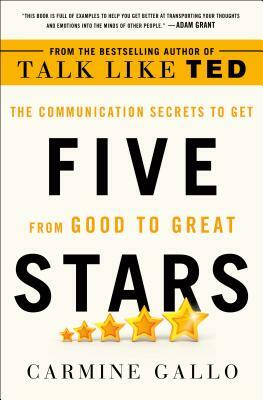 Communication is no longer a “soft” skill—it is the human edge that will make you unstoppable, irresistible, and irreplaceable—earning you that perfect rating, that fifth star. In Five Stars, Carmine Gallo, bestselling author of Talk Like TED, breaks down how to apply Aristotle’s formula of persuasion to inspire contemporary audiences. As the nature of work changes, and technology carries things across the globe in a moment, communication skills become more valuable—not less. Gallo interviews neuroscientists, economists, historians, billionaires, and business leaders of companies like Google, Nike, and Airbnb to show first-hand how they use their words to captivate your imagination and ignite your dreams. In the knowledge age—the information economy—you are only as valuable as your ideas. Five Stars is a book to help you bridge the gap between mediocrity and exceptionality, and gain your competitive edge in the age of automation.